Taksim - Kabatas, the new underground funicular will be opened at the end of 2005. It will provide access to Beyoglu, the modern area of Istambul, to people who live in the suburbs which are located on the other bank of the Bosphorus and on the other bank of the Golden Horn. The tender award decision was taken June 7th, 2002 by the Council of the Greater City of Istanbul and the approval by the Mayor was received on June 17th, 2002 . The construction of the Taksim - Kabatas funicular system is realized by the Yapi Merkesi Construction Inc. - Doppelmayr Tramways Ltd. Consortium. Yapi Merkesi Construction Inc undertakes design works, construction and finishing works of Kabatas underground station which is constructed by cut-over method, 520 meters long deep tunnel construction between the stations, track works, electrical and mechanical works, communication system, supply and installation of escalators and disabled elevators. Doppelmayr Tramways Ltd undertakes supply and installation of two funicular cars, complete drive system, ropes, rope sheaves and tensioning system and related design works. 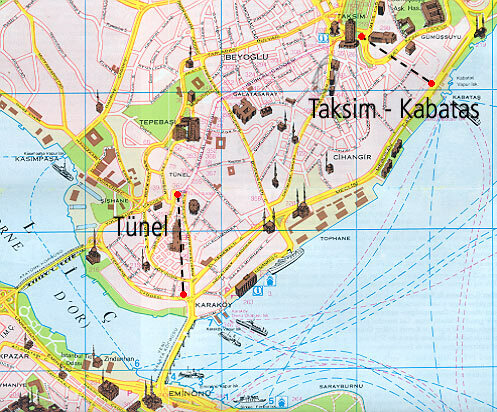 A tunnel has been realized under the buildings to link Kabatas to Taksim. Kabatas is a sea terminal for the boats to the Asiatic part of Istanbul . It is also the terminus of the tramway which links Beyoglu to Eminönu and Sultanamet on the other bank of the Golden Horn . 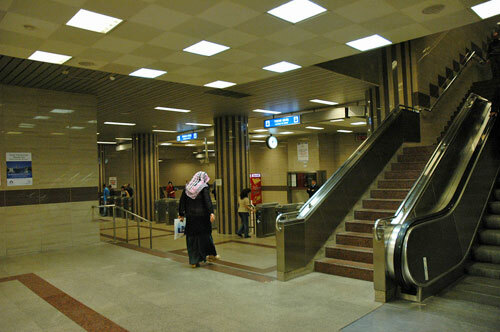 At Taskim, an underground connection is realized with the new metro Taksim - Levent. 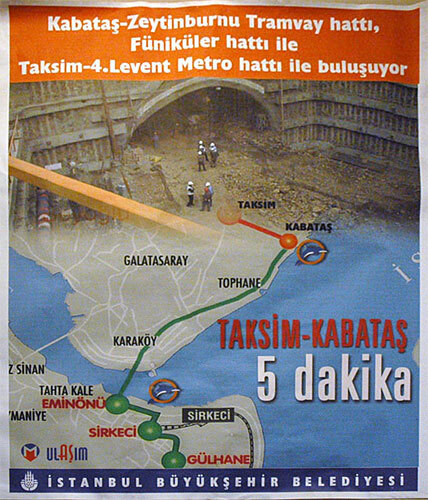 The opening of the new Taksim - Kabatas funicular is planed for December 2005. 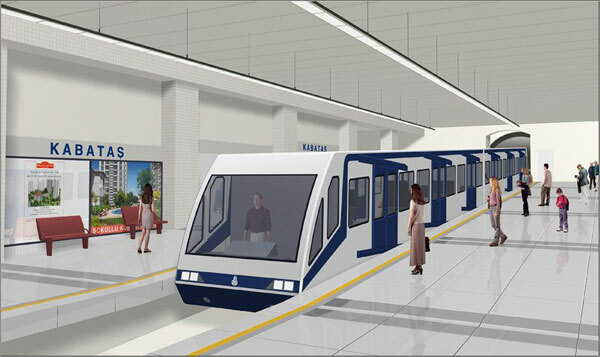 Kabatas to Taksim will now take only 2 minutes with an uninterrupted connection to the metro from the tramway and sea lines with the new funicular! The photos of this article were taken in June 2005. 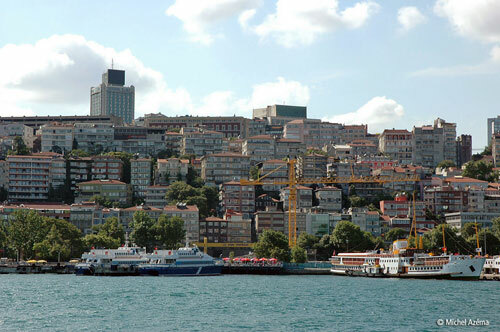 Kabatas pier in the foreground and Taksim on the top of the hill..
Taksim metro station which will be connected to the funicular. Poster showing the connection between the future funicular and the tramway.